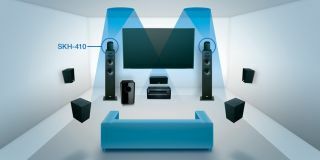 Onkyo extends Dolby Atmos speaker system promotion | What Hi-Fi? Onkyo has extended its Dolby Atmos For All promotion, which means that you now have until 31st October to purchase one of its AV receivers if you also want to pick up a Dolby Atmos-enabled speaker system free of charge. The offer had originally been due to end yesterday [30th September] but will now run for an extra month, with anyone buying either a new TX-NR636, TX-NR737 or TX-NR838 in that time eligible to receive the SKH-410 system at no extra charge from participating dealers. MORE: Dolby Atmos – What is it? How can you get it? By placing the SKH-410 speaker system on top of a pair of floorstanding speakers, you'll have the chance to experience Dolby Atmos in the comfort of your own home as it beams the sound waves onto the ceiling to create the aural sensation of overhead sound. In order to claim the free system, customers will be required to fill out the PDF voucher that comes with your new Onkyo AV receiver. If you already have a voucher with the September expiry date, it remains valid until 31st October. The announcement comes hot on the heels of the release of a free firmware update for the TX-NR636, TX-NR737 and TX-NR838 receivers, which now enables the devices to support Dolby Atmos sound as part of your home cinema set-up.